Written as part of the global campaign for the 16 Days of Activism against Gender-based Violence, this article includes contributions from members of the United Nations University Institute on Globalization, Culture and Mobility (UNU-GCM) research team: Megha Amrith, Inés Crosas, Jane Freedman, Cecilia Gordano, Marta Guasp, Yu Kojima, Parvati Nair, Marija Obradovic, and Aishih Webhe-Herrera. Women’s rights are human rights. It may seem obvious, but it bears repeating on Human Rights Day. The 16 Days of Activism against Gender-based Violence is an international campaign symbolically linking 25 November, the International Day for the Elimination of Violence against Women, to 10 December, Human Rights Day. The team at the UNU Institute for Globalization, Culture and Mobility (UNU-GCM), building on our current research program on female agency, mobility and socio-cultural change, has participated in the 16 Days of Activism with a campaign on ourFacebook and Twitter highlighting issues including the importance of language, women with disabilities, migrant women and refugees, and art as activism. We are using our research to raise awareness on these pressing concerns facing women today, and particularly applying our research to achieving Sustainable Development Goal 5 on gender equality. SDG 5 seeks to end all forms of discrimination against all women and girls everywhere, with a particular focus on eliminating all forms of violence against all women and girls in the public and private spheres, including trafficking and sexual and other types of exploitation. “Language is not neutral: it has an active role in our understanding of diverse realities, our practices and behaviours,” says Cecilia Gordano. She draws attention to a situation when local news reports referred to various “passion killings” that left several women “dead”, arguing that “it’s high time we improved the vocabulary to name gender-based crimes and leave behind the passive voice: women do not just ‘die’, they are ‘killed’, mostly by intimate partners, so they are victims of ‘intimate femicides’.” Media framing, which differs across contexts, plays a critical role in how we perceive gender-based violence. Nils Muižnieks, the Council of Europe Commissioner for Human Rights, points out that “hate speech against women is a long-standing, though underreported problem in Europe”. Not only are these words an attack on women’s right to freedom of expression, but they also violate women’s human rights to privacy, dignity, non-discrimination and life free from violence. Certain groups of women are more vulnerable to violence due to social marginalization. On 3 December for theInternational Day of Persons with Disabilities Inés Crosas drew attention to women with disabilities, who suffer from among the highest levels of gender-based violence. Nearly 80% of women with a disability are victims of violence, and they are three times more likely to experience abuse compared with “non-disabled women”. The research book Gènere i Diversitat Funcional: una Violència Invisible (Functional Diversity and Gender: An Invisible Violence) provides an in-depth examination of the main causes and consequences of gender-based violence against women with disabilities and exposes good practices for dealing with it. Migrant women are another group that is socially marginalized, rendering them even more vulnerable to gender-based violence. Domestic violence poses a particular challenge for migrant women. As we explained in a previous article, any woman suffering from domestic abuse struggles with how to handle the situation. The problem is doubly difficult for immigrant women, who face additional barriers to reporting violence and accessing services. Migrant women must be empowered to denounce domestic violence and access appropriate support without fear of losing their legal residency status. Violence that takes place in the private sphere is a public issue: it is a violation of women’s human rights that the State has the responsibility to prevent. Armed conflict puts women in a particularly vulnerable situation, and protecting female refugees against sexual and gender-based violence in camps remains a major challenge. “Staying in a refugee camp within the country of origin or seeking protection elsewhere brings serious threats to women’s security, freedom and health,” explains Marija Obradovic. The precarity of female refugees often goes unnoticed, and this is especially true in the case of minority groups, such as the Rohingya in Myanmar. “Given their status as women, stateless and part of an ethno-religious minority, Rohingya women (and girls) are particularly vulnerable to sexual and gender-based violence that can affect not only their physical and psychological development but can restrict the socio-economic opportunities available to them both within Myanmar and in their new country of residence,” notes Yu Kojima. Human trafficking frequently involves the forced movement of people across borders, and it is a form of violence that disproportionately targets women. The UN has made trafficking a focus of the International Day for the Abolition of Slavery, which falls during the 16 Days Campaign on 2 December. Human trafficking should not be conflated with slavery, but action is needed in order to advance policies that prevent trafficking, rescue victims and provide for reintegration and prosecute traffickers. A holistic human rights approach is critical to respect the dignity of all victims of trafficking while working toward its eradication. Across the world, activists are finding creative strategies to bring attention to women’s human rights. “Literature, music, performance, and the arts are powerful tools that reach wide sectors of society, appealing to their sensitivities, interests and worlds in languages far removed from the realm of international human rights law, but intimately connected to it,” argues Webhe-Herrera. Gordano gives another example of Mexican artist Elina Chauvet, who collected 33 pairs of women shoes painted red in Ciudad Juárez and arranged them on the public space in 2009. She called it ‘Zapatos Rojos’ [Red Shoes] and conceived it as “a meeting of art and collective memory” to rise awareness on feminicides, the most extreme materialization of gender-based violence. “It is through the ethics and aesthetics, through absence and visibility [that] red shoes show the void left by the daughters, sisters, mothers and wives.” Her artistic intervention has been replicated in various cities in Latin and North America and Europe. Photography is another powerful medium for advocacy. Megha Amrith tells the story of Xyza Cruz Bacani, a Filipina domestic worker turned photographer. “Her photographs, documenting migrant domestic workers in a Hong Kong shelter who escaped physical and mental abuse, won her a photography scholarship for raising awareness about the grave situations that migrant domestic workers live through. In this new series of photographs, she demonstrates how gender-based violence and labour abuses are common experiences among migrant women across countries and continents,” explains Amrith. 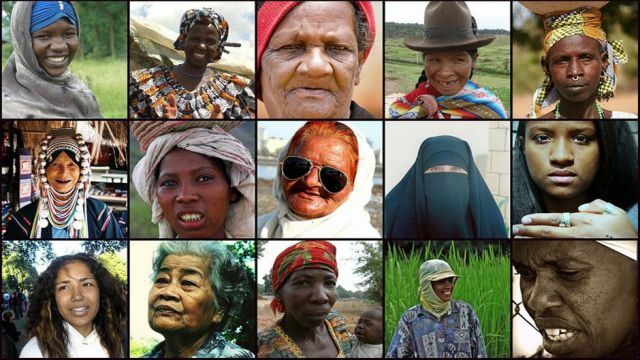 The UN took a major step in recognizing women’s rights as human rights in the 1993 Vienna Declaration. Campaigns such as the 16 Days of Activism draw attention to the challenges that we still face so that we can continue making the necessary policies and changing attitudes to fulfill women’s human rights. This year, the focus of the 16 Days Campaign is on the relationship between militarism and the right to education. As such, it is essential to consider the impact of ongoing conflicts across the world on education, particularly for young girls who are living in situations of conflict or who have been displaced. Alongside all these stories of the violence women face, there is optimism to be found in stories of empowerment. UNU-GCM’s Women of the World project tells the stories of 16 immigrant women in Barcelona, and these are examples of agency and empowerment. While 16 Days of Activism alone cannot put an end to gender-based violence, it is a critical platform for raising awareness and demanding action. Women´s Rights are Human Rights by http://ourworld.unu.edu/en/womens-rights-are-human-rights is licensed under a Creative Commons Attribution-NonCommercial 4.0 International License.